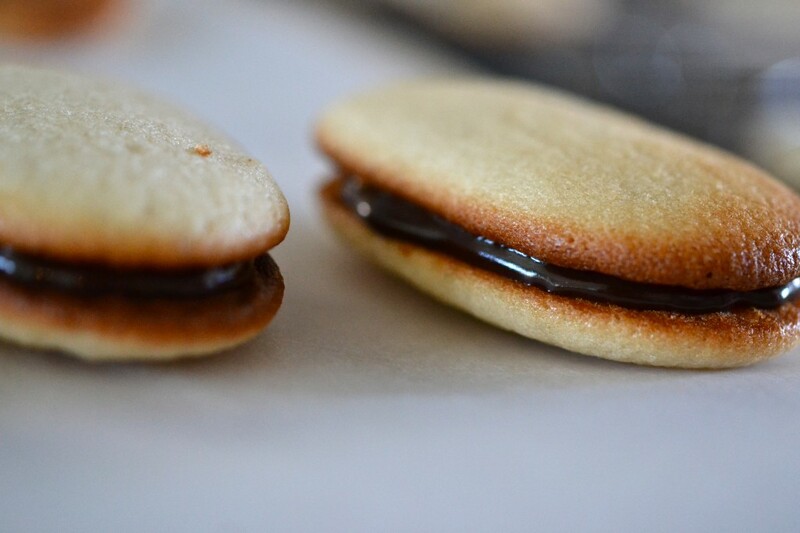 [pinit] Missing Milano cookies now that you’re gluten free? No more. 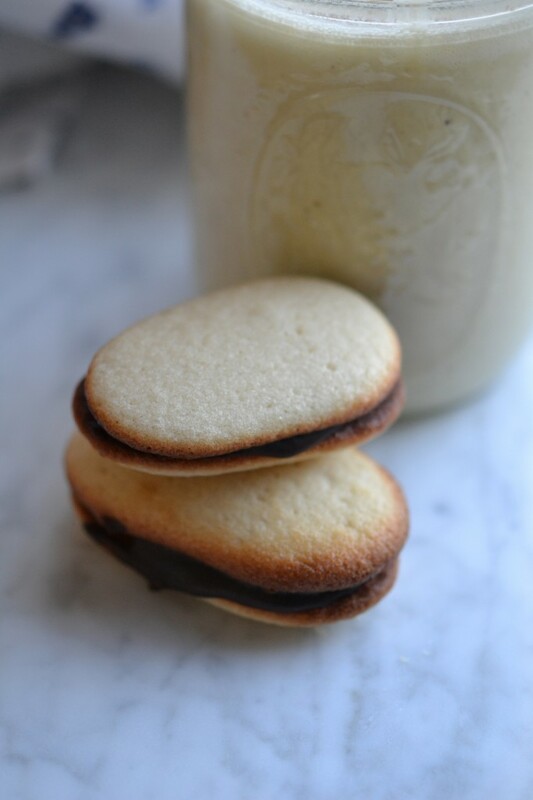 With this gluten free cookie copycat recipe that is a true clone of Milanos, miss them no more! 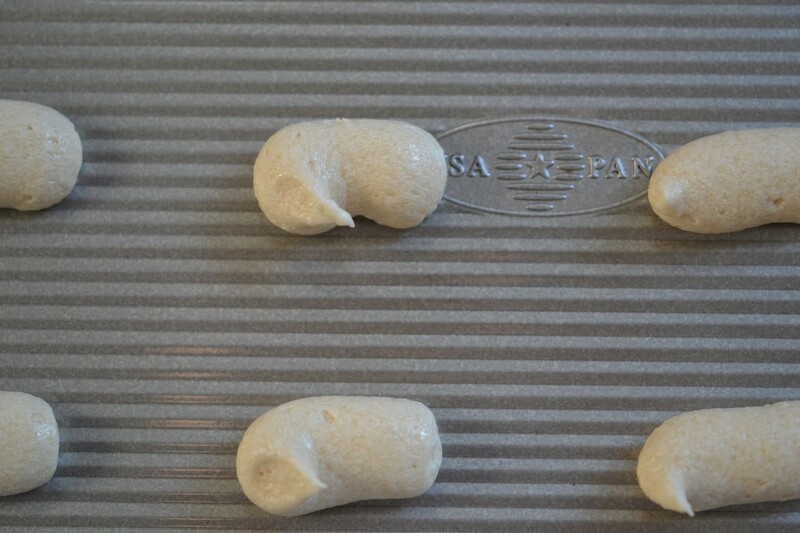 Pipe out the dough with a plain pastry tip. It doesn’t much matter if the ends stick up. Or curl over a bit. Just space them nicely on the pan, since they’ll spread as they bake. And look like this. Better to underbake than overbake. When they are beginning to brown around the edges, like this, they’re ready. Cool them on the pan for a few. Then transfer them to a wire rack to cool completely. And you make the ganache filling. I’ll tell you all about it. Then turn ’em over & line ’em up. Spoon ganache on half of them. Assemble, and allow the chocolate to set. Then serve with chilled Egg Nog. Who needs sugar plums? I’ve got visions of this dancing in my head. Save some for Santa. In the bowl of a stand mixer fitted with the paddle attachment, place the flour, xanthan gum, confectioner’s sugar and salt, and whisk to combine. Add the butter and shortening, and beat with the paddle attachment until combined. Add the egg whites, and then the vanilla extract and lemon juice, and mix until smooth. 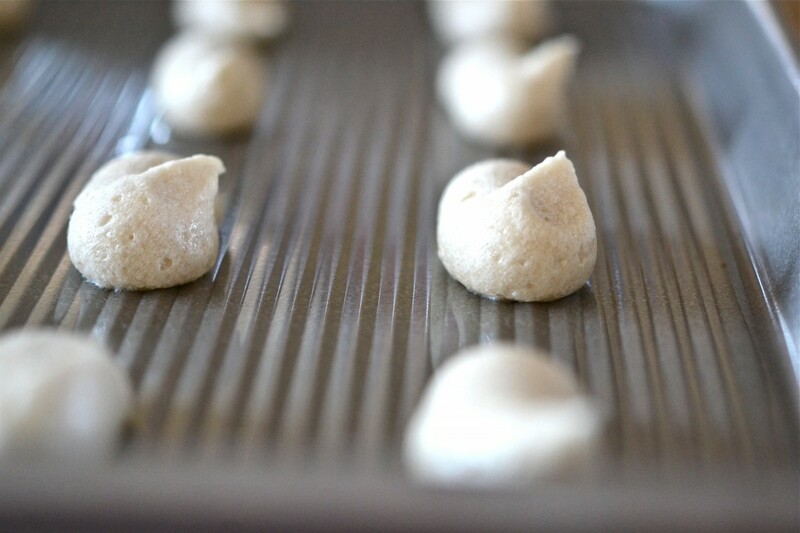 Fill a pastry bag or Ziploc bag with the batter, and, with a plain round tip, about 1/4inch in diameter, pipe 1 1/2-inch sections of batter onto a parchment-lined rimmed baking sheet, spacing them 2 inches apart, as they will spread while baking. Place in the center of the preheated oven for 8 to 10 minutes, or until beginning to turn light golden brown around the edges. Let cool on the pan for about 5 minutes, then transfer to a wire rack to cool completely. 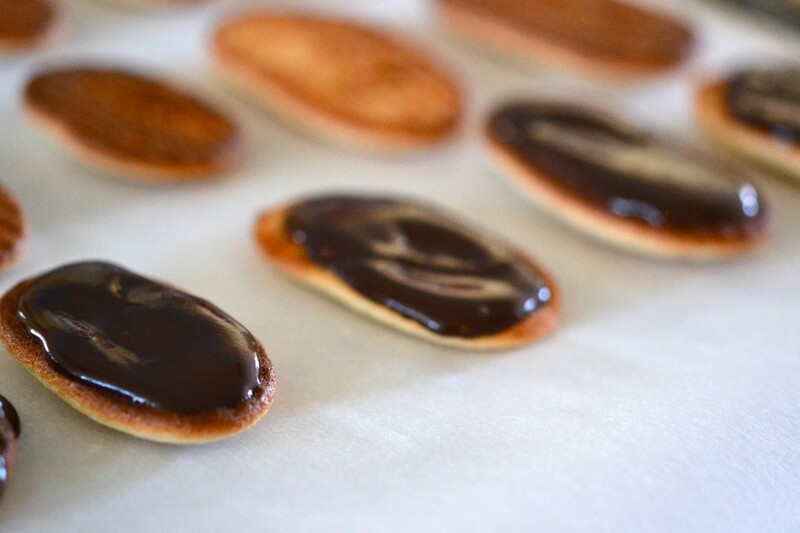 While the cookies cool, make the ganache filling. Place the chocolate in a medium-sized heatproof bowl and set it aside. In a small saucepan over medium heat, heat the cream until beginning to bubble around the edges. Pour the hot cream over the chocolate, and mix until all the chocolate is melted and the mixture is smooth and shiny. Set the chocolate aside to cool slightly, but still soft. 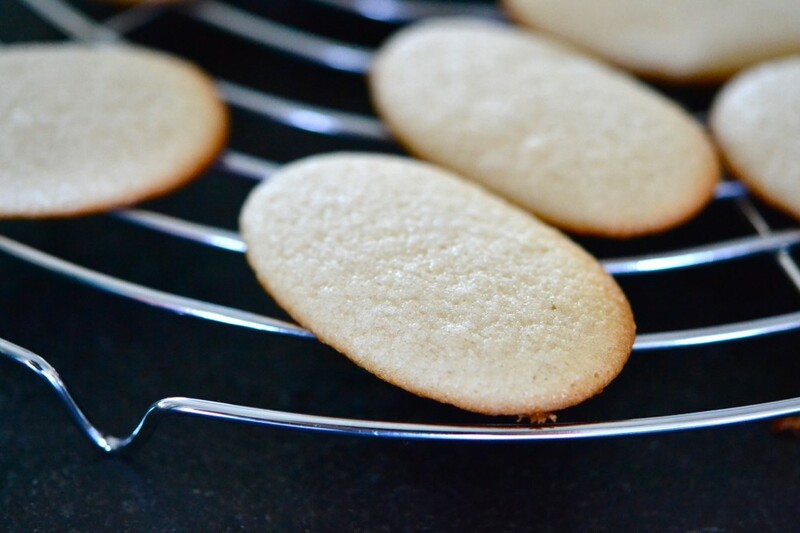 Once the cookies are entirely cool, turn them all over, flat side up, in a single layer. Spoon a thin layer of filling onto the flat side of half the cookies. 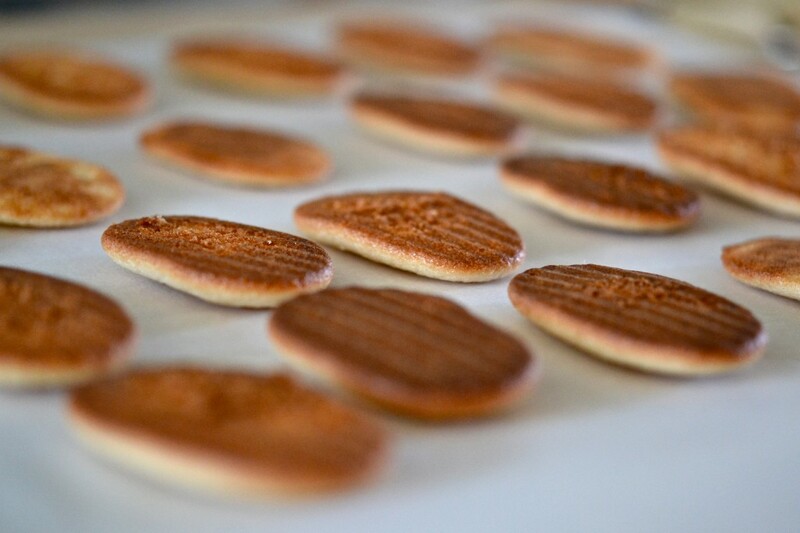 Press the flat side of the remaining cookies on top of the filling, lining them up as best you can. Allow the filling to set. Serve at room temperature. Store leftovers (ha ha) in the refrigerator or freezer, separated by sheets of parchment paper. Perfect! I found it!! Thank you! by the way, my friends loved them, but can have gluten, how can the recipe be changed so they can make them?? Welcome, then. If you slip these into the Christmas cookie pile, I bet they’ll be the first to go! I love mint. Mmmm mint milanos… My husband is from Philly, & I will have to tell him that you called them “jimmies.” He swears that sprinkles are one thing, and ‘jimmies’ are another. Me? I like ’em all, as long as they’re GF. Yes jimmies and sprinkles are different things. I’m in southern new england and use to work at ice cream places. When you add “shots” to the mix it can be fun. Looking forward to the cupcakes. Gotta grab some more ap mix today so i can bake something. You’re absolutely right–good point. We should make our own junk food–at least it’s probably safer than the stuff in the package from what I’m reading about what’s really behind commercial packaged food. Better tasting too! I was feeling sad in the store the other day becase the Pepperidge Farm milanos were on sale. This is perfect timing. I think I will add peppermint to the chocolate to make mine Mint Milanos. YAY!!! That’s so funny cause the Pepperidge Farm Milano commercial has been all over my tv lately and I never even liked those cookies, but now that I can’t eat them I can’t stop thinking about them. These look wonderful! My favorite are the Orange Milanos, so experimenting I will go! Just add some orange zest to the chocolate ganache. You can also replace the lemon juice in the cookies with orange juice or, better yet, orange extract. I wouldn’t add zest to the cookie batter, though, since the zest will almost certainly clump. Enjoy! NOM! I am so making these….and SOON! Thanks! I wish I could like this a gazillion times. 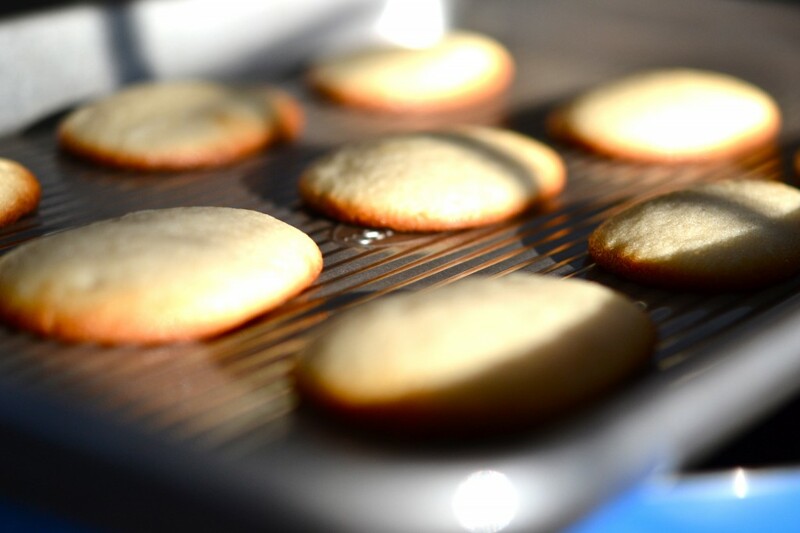 *sigh* Hello beautiful cookies…. My stomach is already growling! These look delicious!!! Can’t wait to try these this weekend. I’ve been waiting to share them, too! So glad you’re going to give them a try! Can’t wait to hear how they turn out. Oh I was watching a Milano commercial the other day, drooling btw, and wishing for a GF version. This morning I wake up and here it is. I’m not sure if I should try it, it might become my newest obsession. Thanks Santa, um I mean, Nicole! So Nicole, have you ever thought about doing a whole cookbook on cookies? Maybe cookies and bars? I know I would buy one. :) But the way, we loved the gingerbread cookies.